A quick dessert I whipped up for my BF using leftover no-sugar-added peanut butter cookies. Crumble one peanut butter cookie into the bottom of a pretty glass. Top cookie with 2 tablespoons of strawberry preserves. 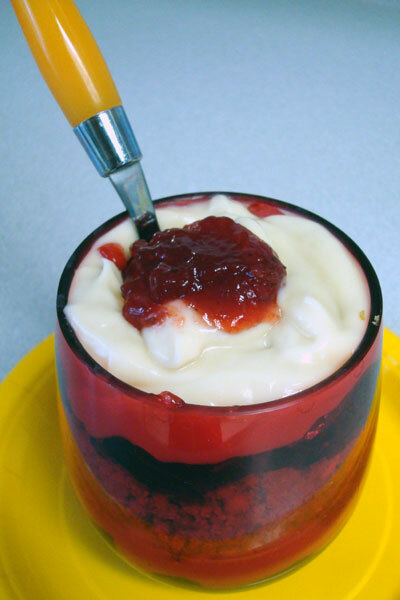 Top preserves with half of pudding cup. Repeat layering process, using last cookie, another two tablespoons of preserves and remaining half of pudding cup. Finish parfait with 1 teaspoon of strawberry preserves on top of last pudding layer. Entry filed under: food review, recipes. Tags: healthy desserts, low-calorie desserts.